You've just arrived and the last thing you want to do is get back in the car and drive around searching out the essentials you need to kick-off your stay. 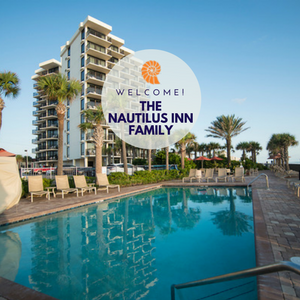 The Nautilus Inn is located on the family friendly south end of Daytona Beach, adjacent to Daytona Beach Shores. Our What's Nearby Guide is the essential source to what you need within a mile or so of the Nautilus Inn. So, get out and streatch your legs or hail a taxi! Of course, the regular pizza delivery is always available. But there are also other services which can delivery the best of many area restaurants directly to the Nautilus Inn. Dining in has more options than ever before! Grubhub is the nation's leading online and mobile food ordering company dedicated to connecting hungry diners with local takeout restaurants. The company’s online and mobile ordering platforms allow diners to order from more than 80,000 takeout restaurants in over 1,600 U.S. cities and London. Every order is supported by the company’s 24/7 customer service team. Chow Cab Daytona Beach, Ormond Beach & Port Orange are now powered by Bite Squad! Bite Squad is the last place you'll ever have to go online to order yummy cuisine for delivery or take-out. We've partnered with local restaurants, hand-picked our food lovin' customer support squad, and wrangled up a fleet of environmentally friendly vehicles to get fresh food from the restaurant straight to your door, quickly and hassle free! Sometimes, you just can't beat the convenience of grocery delivery. Not need to get back in the car to get the staples you desire for dining in. Plus, who really wants to give up valuable vacation time to grocery shop? Publix now offers delivery in select areas across the Southeast including Daytona Beach. Florida's favorite is now just an online order away! Their grocery and liquor delivery services are fast and easy. You can enjoy the same quality products that you expect from Publix delivered to your door -- usually on the same day, often in as little as an hour. There's plenty of ways to get around Daytona Beach! 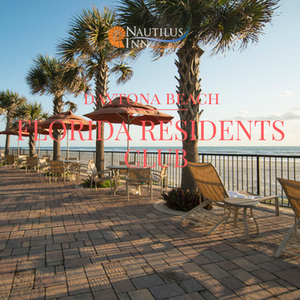 Plus, so many things that make our area popular - restaurants, attractions, stores and services are all within a short drive of the Nautilus Inn. An easy way for our visitors (and residents) to access Votran routes and know when to board/exit the bus is on a free app called MyStop Mobile. With it, you can easily use the "Trips" function to plug in where you are and where you're going. It gives you several route choices, tells you how far you need to walk to catch the closest bus, when you'll arrive at your destination, and more. The "Alerts" tab will even let you know if your bus is early, late, or right on time. Votran, a service of Volusia County government, provides access to shopping, employment, healthcare and entertainment in the Volusia County area. Riders enjoy clean, comfortable and energy efficient public transit by riding Votran. If your trip starts or finishes on a bicycle, Votran buses offer convenient bike racks on the front of the buses; space is limited.